I feel compelled to share the flood hydrograph one last time, and give the follow up to the flood drama of the week. As you can tell from the hydrograph, the waters have receded and we are oh so happy about that! 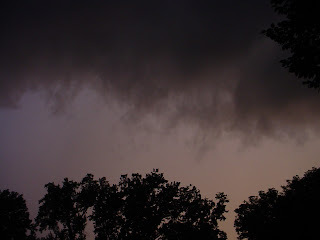 In the throes of the drama, we were slightly confused by the lack of rain on the day that we were supposed to flood (river crest was predicted to be 17 feet – our field starts to flood at about 12 feet). We were scrambling to get all of the onions and garlic out of the field and the sun was shining and it ended up being a quite nice day. Then we heard they lowered the flood prediction to around 10 feet! 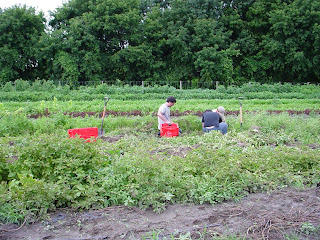 Well – there’s no fear of us flooding at 10 feet, so we eased off on the harvesting, and tried to relax. That’s about the time that other farms were reporting flooding in their fields (Healthy City farm, Diggers’ Mirth and Pitchfork Farm). Turns out the equipment that takes the above measurements broke at a critical moment for us farmers. You can see that squiggly spot there at the crest. That’s where the machines broke. They really have no sense of what the actual crest was, though I know that my friends at Healthy City were coming back from their fields with their clothes wet to their waists – about 4 feet in spots, I think. 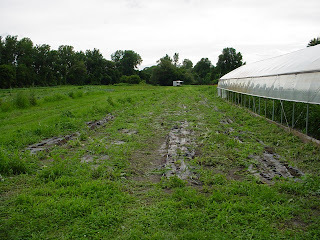 SO, turns out the Intervale CAN flood in the middle of summer – as if we weren’t paranoid about the weather already! I wanted to share pictures of the aftermath of our process, and then we can all move on! 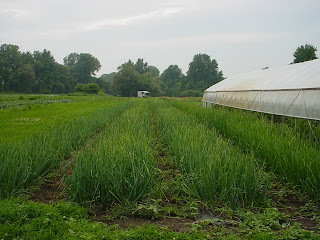 Our onion field Thursday afternoon. 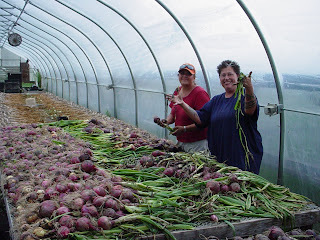 I really wish I had gotten pictures of our crew pulling all the onions and shallots out – it was so great to have all the help! 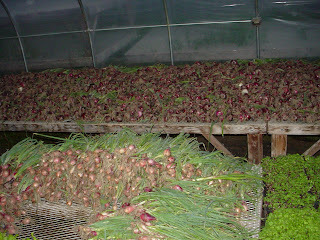 Some of the onion bunches that we made to sell at market. Some of our helpers pulling our colored carrots out – thanks guys! 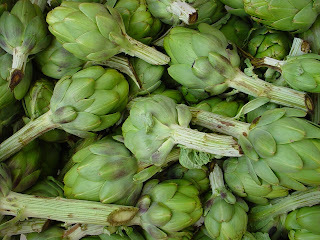 I harvested out the artichokes from or swale – the lowest spot on our farm, sure to flood first. 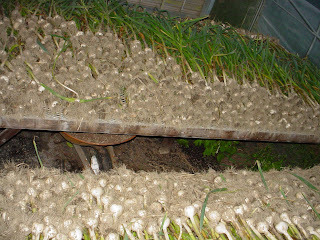 All of our garlic that Spencer and Chloe harvested out Thursday morning – drying nicely in the greenhouse. 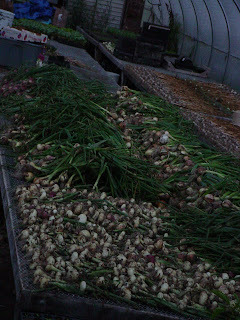 Some of our cipollinis (rear) and some of the shallots (front) that were pulled by our crew and taken back to the greenhouses to dry. The white cipollinis and more shallots. 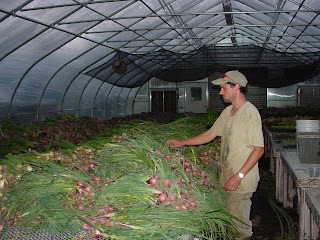 Spencer contemplating the massive onion harvest. 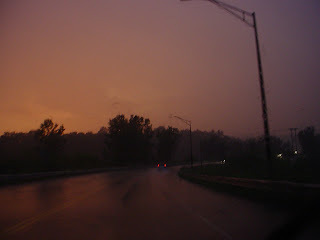 I “safely” snapped this shot in the torrential downpour while driving home – such a strange sky! Here we are Saturday after market dealing with all the heaped up onions – trying to spread them out nicely for a good even dry and cure. 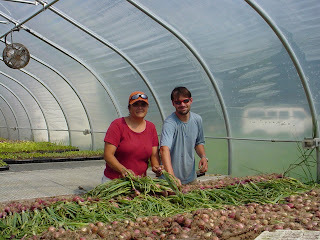 Here we’re working on shallots. Our friend Emily came down to help us with this stinky and sometimes goopy (decaying onion tops) project – what a trooper! Thanks, Emily!!! Trim the ends off each onion then halve lengthwise. Remove peel and finely slice into half moon shapes. Set electric skillet to 300 degrees and add butter. Once butter has melted add a layer of onions and sprinkle with a little salt. Repeat layering onions and salt until all onions are in the skillet. 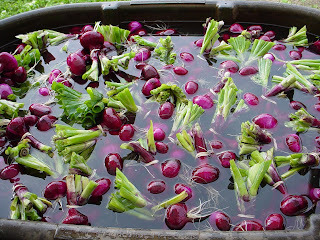 Do not try stirring until onions have sweated down for 15 to 20 minutes. After that, stir occasionally until onions are dark mahogany and reduced to approximately 2 cups. This should take 45 minutes to 1 hour. Do not worry about burning. Place oven rack in top 1/3 of oven and heat broiler. Cut country bread in rounds large enough to fit mouth of oven safe soup crocks. Place the slices on a baking sheet and place under broiler for 1 minute.